124 CHAMPLAIN, Samuel de. Carte geographique de la Novelle franse en son vray mondia. Paris, 1612. Coll�e sur papier fort. D�chirure � droite de la carte sur 9 cm restaur�e. Marge inf�rieure droite manquante.- Laid down on strong paper. Repair of tear 9 cm into engraved area in the right hand part of the map. The lower part of the right hand margin is missing, not affecting the engraved area. 255 x 340 mm. 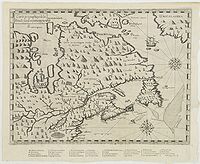 � Premier �tat de la carte publi�e par Champlain dans "Les Voyages du Sieur de Champlain" fin 1612 ou d�but 1613. Elle figure la d�couverte de la baie d'Hudson par Henry Hudson. - First state of the map published by Champlain in "Les Voyages du Sieur de Champlain" in either late 1612 or early 1613. The discoveries of Hudson have been incorporated and provide a remarkably accurate interpretation of the geography of the region. The map related the numerous voyages of Champlain to 1611, and the English further to the north. Most particularly recorded is the discovery by Henry Hudson of the bay named after him. It is noted, with the legend noticeably in English, "the bay wher hudson did winter". - Kershaw, Early printed maps of Canada, 61 ; Burden, The Mapping of North America, 161. 125 BELLIN, N. Carte de la partie Orientale de la Nouvelle France ou du Canada. Paris, 1744. Coll� anciennement sur papier fort. Petit manque de papier � droite le long de la bordure, d�chirure � droite de la carte sur 12 cm restaur�e. - Laid on strong paper, a small loss of paper along right border, repair of tear in the right part of the map 12 cm into engraved area. 400 x 555 mm. 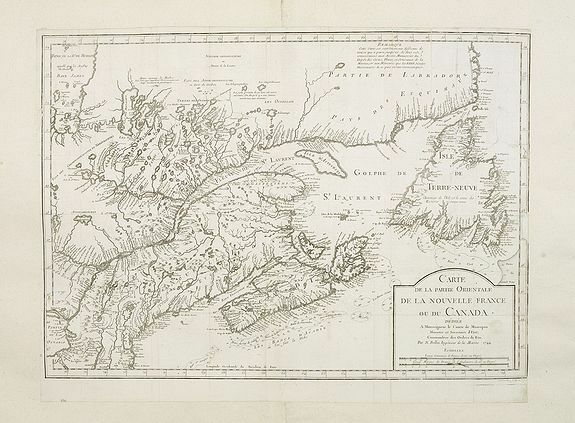 � Nicolas Bellin's landmark map of maritime Canada in a first appearance, from "Charlevoix's Histoire.." in 1744. Later he used the map as a basis for his equivalent maps of 1745 and 1755. This map was also copied by Collyer and Jeffery's, E.Bowen and Turner of Boston. Engraved by Desbrulins. No reference number in lower margin. 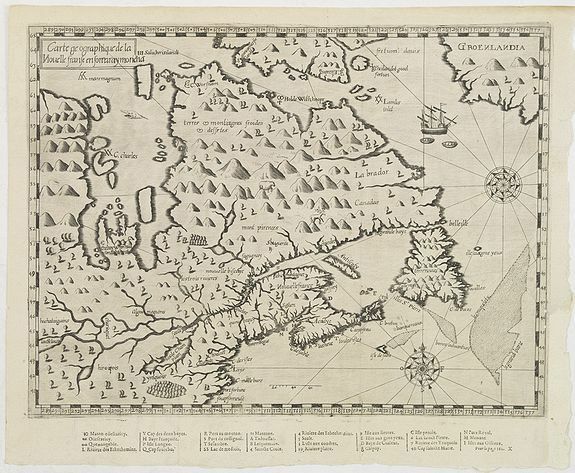 - Kershaw, Canada, 684-5; JCBL, New England in early maps 744.2. 128 DE BRY, Th. Americae pars, Nunc Virginia dicta, primum ab Anglis.. Francfort, 1590. Coll� sur papier fort. L�g�rement bruni dans la marge sup�rieure. - Laid on strong paper, small marginal repair. Paper slightly age-toned as usual, some browning in the upper margin. In good condition. 304 x 418 mm. � Deuxi�me �tat. La carte de John White, superbement grav�e, est la premi�re � repr�senter et � nommer la baie de Chesapeake. Ses trac�s de c�te serviront longtemps de source principale aux cartographes ult�rieurs. - John White's map, elegantly designed and superbly engraved, revolutionized geographic knowledge of the region. Although White left the Chesapeake poorly explored, much of his coastal data became the principal source for subsequent mappings for many years. John White was governor of the ill-fated Roanoke colony in North Carolina that was the first English attempt to settle North America. 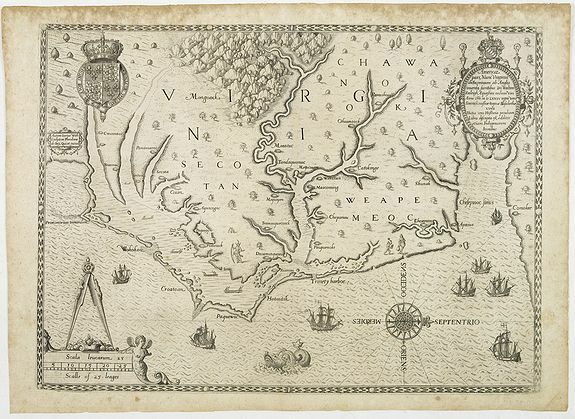 The earliest collectible map of Virginia and North Carolina and also the earliest to show and name the Chesapeake Bay. Its numerous pictorial elements include English ships outside the Outer Banks and at the entrance of Chesapeake Bay, Indian canoes around the Albemarle and Pamlico Sounds, Indian figures, the royal arms of England, etc. Quinn describes the map as the "most careful detailed piece of cartography for any part of North America to be made in the sixteenth century." A state two. - Quinn, Roanoke Voyages, 847-8; Burden, 76 -S.2.